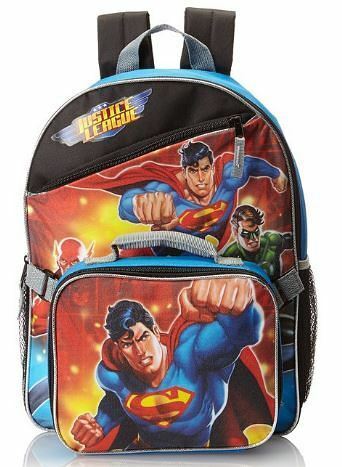 Justice League Backpack with Lunchbox Just $7 + FREE Shipping with Prime! You are here: Home / Great Deals / Amazon Deals / Justice League Backpack with Lunchbox Just $7 + FREE Shipping with Prime! Looking for a new backpack for your kiddo? Head over to Amazon and get the Fast Forward Boys Justice League Backpack with Lunchbox for just $7!!! It’s regularly $25.00 so that’s getting it for 72% off. Shipping will be FREE with Amazon Prime or an order of $35 or more. Backpack with detachable lunch kit. Adjustable shoulder straps are padded for carrying comfort. Zipper closure, features one main compartment, one front compartment and two side mesh pockets.